When it comes to photos and the internet, the mantra is “if it looks too good to be true, then it probably isn’t true”. Surprisingly, that’s something many people, including journalists, often ignore, and as a result they tend not to apply the care that online photo verification requires. 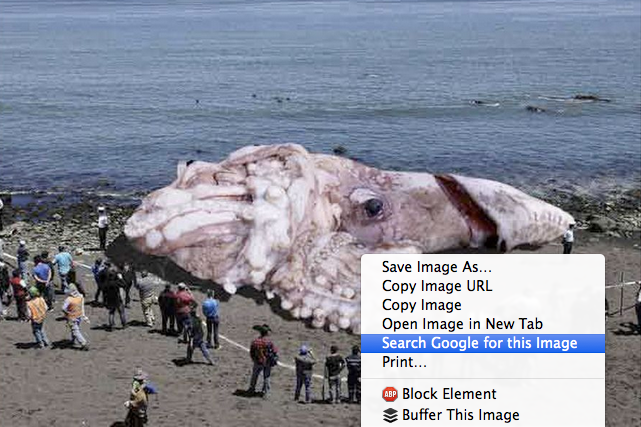 From disaster movie wallpapers masquerading as hurricane Sandy pictures to an image of a radioactively mutated 50 metre giant squid, internet photo hoaxes are regular occurrences, with journalists often joining gullible social media users by falling into the trap. There are a number of ways to test whether a photo is genuine, and while some cleverly photoshopped images may escape scrutiny it is always worth checking up on an image you have doubts about. This is where Google image search comes handy. While it is not completely full-proof, running a picture through Google’s image archive should be the first stage of the process, and it will often allow you to dismiss a photo as being fake in a matter of seconds. A Google image search can be done in one of two ways: either by dragging the photo to a tab or window in your browser open on the Google image search page, or by using a chrome extension. Go to images.google.com/ and click the image button (PHOTO 1). Then simply drag the photo into the image search box, as in the video. Install this chrome extension and right click on an image found online to run it through Google image search. The results it gives will show the extensive history of the image, including when and where this image has appeared previously and what other, visually similar images are available. This can offer an indication of whether the image has been tampered with. In our example, the photograph of the shark supposedly swimming in the streets of New Jersey can easily be identified as fake, since articles linking to the image were available a long time before Hurricane Sandy took place. This may seem like an easy example to pick, and it probably is. However, a lot of the fake images that start trending at the time of, for example, an extreme weather event have appeared online in the past, either as an internet hoax or images of an actual event that may have taken place at a completely different place and time. This just shows how easily they can be debunked with a simple Google image search. Here’s more on that from this Storyful blog post, taking you through how easy it was to debunk fake photographs that appeared during the lead up to Hurricane Sandy.